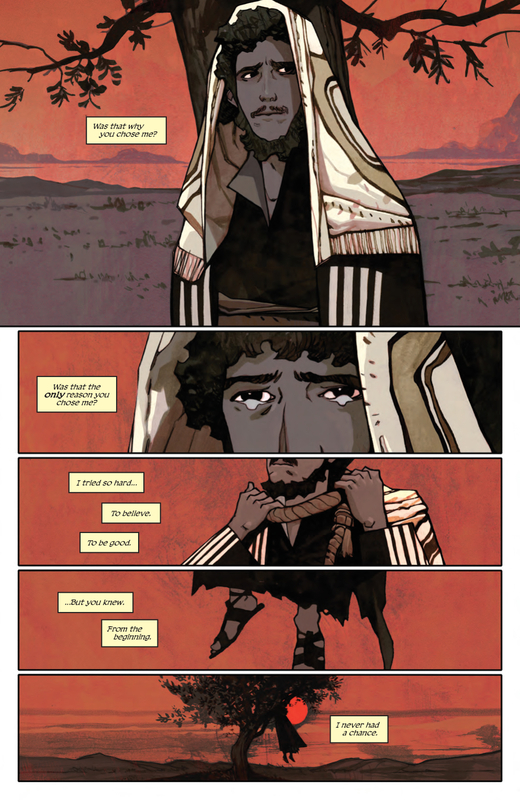 Already vying for our favorite comic of the year, Judas (Boom! Studios), a four-issue series from writer Jeff Loveness and artist Jakub Rebelka. In it’s short run, it packs more theological punch than an entire semester on the subject. It’s difficult to say much about the series without spoiling the narrative, but suffice it to say that Loveness takes a sympathetic approach to one of literature’s greatest villains, and as we (Benjamin and Ryan) have long been fascinated by this villainization, it just might be our favorite bit of pop spirituality we’ve ever encountered (at least certainly in comic books). Do yourself a favor and seek out these four issues, or download them if you have to. For more on this incredible work of pop theology (with one or two minor spoilers), check out our interview with Loveness below. Why Judas? Has this been something you’ve wrestled with for a long time? At what point did you decide to turn that “obsession” into a comic series? I was always fascinated by Judas. His story is steeped in tragedy, but it’s almost an afterthought in the tapestry of Christ’s story, which is all about love and forgiveness…except for Judas. I thought focusing on Judas, and especially what happened after his betrayal, would be a fascinating opportunity. And then it built out into so much more. It’s not too small of a thing to say that this is a rather theologically and spiritually profound work of art. We have been moved by Jason Aaron’s The Goddamned, but in a different way. There’s an edge…an anger…to his re-telling of the Cain story that isn’t characteristic of your approach to Judas. You have more sympathy here, not just for Judas, but, it seems, for all of your characters. Can you talk about walking that line of forcing readers to reconsider a sacred story without being sacrilegious in the process? The affirmation of faith here, in the end, isn’t something readers often find in pop culture takes on Biblical narratives. I guess it parallels with my journey through Christianity. I was raised deeply religious. I am not religious now, but my parents are devout Christians and I harbor no resentment or ill will towards them. They’re great people. But there are issues with Christianity I can’t reconcile. So I wanted to take that emotional crux and extrapolate it onto the actual Biblical narrative. I knew it was risky. But I wanted to take that jump and try for it. And I wagered that other readers out there would have the same dynamic with Christianity that I did. How involved were you in the design and look of the series? Talk about your relationship with Jakub Rebelka. I was very involved from the get-go, weighing in on decisions and chiming in where it was appropriate, but Jakub and the editors at Boom really knocked this out of the park. They added so much to the story. The black halo around Judas came from them. Absolutely brilliant idea. Jakub is truly a genius. He nailed this. He went above and beyond what I could have imagined. Such rich, dark imagery that tapped into Christian iconography. I still get emotional thinking about the level of craftsmanship he brought to this. Spoiler alert (! ): you’ve turned Judas into a Christ-figure in hell. For some, this will be a thrilling revelation. For others, it will be disappointing for a couple of reasons: either there seems to be no hope for Judas…no redemption…or his redemption might come in service to others while still being unable to escape the punishment for his choices in life. Talk about arriving at this ending. Were there other options that you entertained and ultimately rejected? The ending came about through me weighing the pros and cons of Christian faith. At the end, maybe parts of the story, the truth of it all, leave us unsatisfied, like Moses [being] unable to enter the Promised Land or Judas being stuck in Hell. But then, beyond our own personal pain, there is a deeper truth, and that is love. No matter where we are or how we have been hurt by the story, we can love…and maybe that’s the lesson of it all. Judas sacrifices himself and embraces the grace. He acts like Christ. From the beginning, that was the only ending. I tried other things, but I can barely remember what they were. I couldn’t get the “For they shall see God” out of my head. What does that mean? Well, the Bible says “God is Love.” So the final image–Judas bringing love to Hell–would mean that, for the first time, all the tortured souls of Hell saw ‘God.’ They experienced love in this hopeless place. I dunno. It’s hard to explain, but I loved that imagery. I’m glad Boom did too. I think you also give a surprisingly complex (theologically and otherwise) portrayal of Jesus. We don’t often think of Jesus needing to be forgiven, but there are moments in scripture where he certainly walks a fine line (I’m thinking of his interaction with the Syrophoenician woman at the well and, obviously, his interactions with Judas that virtually lead him into betrayal). Is this something that you’ve thought about for some time, or did you arrive at this aspect of Jesus’ character as you were writing this story? I almost cut that part out of the story. I wasn’t sure if I wanted Jesus to ‘sin.’ I worried that would be too much. But the story kept leading me there. And then it became the crux of the entire story: Jesus with Judas in Hell, needing himself to be saved. There was no other option for it. Jesus being overwhelmed by the sin of humanity…only to be saved by the betrayer. It’s the only way this story could go. Traditionally, Satan and Judas have been considered Christianity’s greatest villains, but, while you find redemption for Judas, Lucifer remains bound to his fate. Could you speak to the choice to redeem one over the other, despite both holding instrumental roles in salvation history? I kinda feel like Satan’s made his bed, and he’s too stubborn to change. I DO think he is misunderstood. I’ve always loved the romanticized notion of Satan: the failed revolutionary of Heaven…the Trotsky of Hell. But I don’t see him changing his stripes. He’s too bitter and stuck in his ways, and he wants to burn God’s story down with him. But Judas is human, and while he has reason to be furious, he might also have a chance of being redeemed. The journey of the story is about Judas letting go of his rage and opening himself to grace, even if it is terrible grace. The addition of Judas’ mother is certainly a humanizing element but, aside from the lesson he learns about finding hope in the face of the cruelty of existence, was there any thought to drawing a parallel to Jesus’ relationship with Mary? Unfortunately, due to the brevity of the series, there were things we wanted to dive into, but couldn’t. I wanted to show more of Jesus and Judas’ relationship on Earth, Judas’ relationship with the other Apostles, and Jesus’ relationship with them, and others like the two Marys. But…that’s comics. You gotta keep the narrative tight and moving. Maybe we’ll get to it in Judas 2! Speaking of Judas 2, could we convince you to adapt some other Biblical characters or narratives??!! Lot’s Wife is MINE. Nobody steal my 19-issue opus about Lot’s Wife!